Not far from Los Angeles’ city center, in the suburb of Cerritos—which is just minutes from Artesia’s famed Little India—chef Thomas Ortega has established his own brand of Alta California cuisine, or contemporary pocho cuisine, a growing style of Mexican-American cooking in Southern California. Ortega’s Cerritos temple to pocho chic is Amor y Tacos, which has a secret mole menu that celebrates one of Ortega’s favorite dishes. His mole coloradito is very personal, beginning as a basic mole poblano (a scaled down version of Puebla’s famed dish found in all states of Mexico and here in the U.S.), Oaxacafied in collaboration with one of his Oaxacan cooks, and then poured over all-American tater tots. The coloradito is now available on the secret mole menu, which is also the base of the Sunny Egg Tostada that I loved at last year’s Taste of Mexico event. The chili is the star in Ortega’s mole coloradito, due to light toasting, no frying and less chocolate, which the chef does to lean towards the heat instead of the bitterness derived from traditional technique. 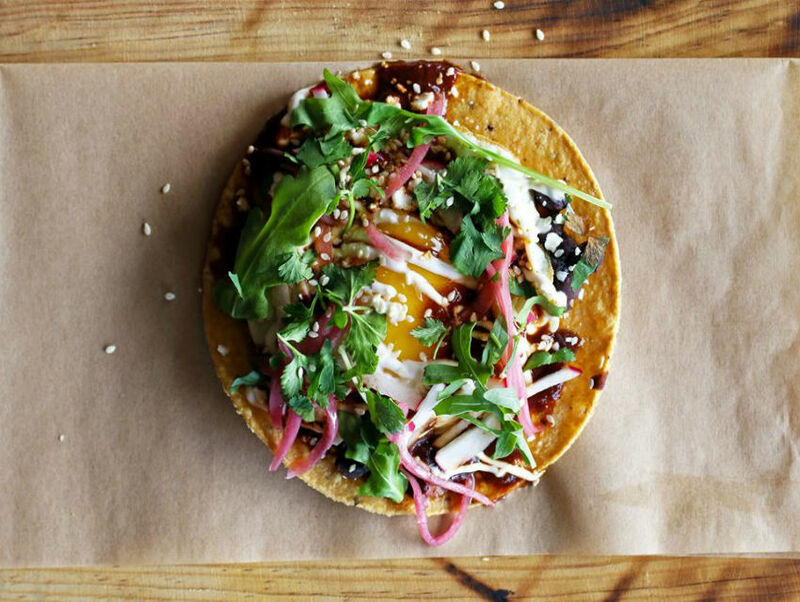 For the sunny egg dish, the mole is spread over the tostada, which is covered with a yolky egg and topped with thin stripes of Mexican cream, arugula, sesame seeds, cilantro, and pickled onions. It’s yet another way to enjoy mole, a luxury exploited by Mexican-American chefs like Thomas Ortega at Amor y Tacos, where tacos and love make the world a more delicious place—and it’s just a few freeways away.